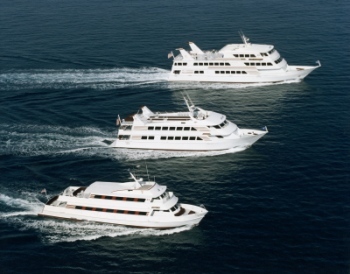 Below are is a short list of our broad-range of offerings for your Party Yacht needs. Millionaire’s Concierge has a full staff to ensure your party goes off without a hitch. Arranging a Party Yacht can be very confusing, there are a lot of options you need to think about. Feel free to browse below, but the best way to fully understand all we have to offer, either call us at (954) 564-7074 or fill out the form to the right and we’ll get back with you ASAP. Whatever your business needs, the Miami yachts of Millionaire’s Concierge will make sure your event is one your employee’s, investor’s and customer’s will talk about for years to come. From entertaining clients and investors, to recognizing employees, celebrating milestones and introducing products, you will find one of our Party Yachts the perfect venue. 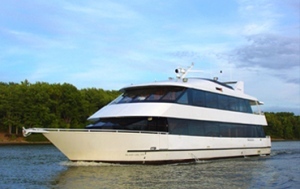 We have a 130′ magnificent party yacht charter vessel that is an ideal location to host any elegant wedding ceremony, private dinner cruise, corporate cocktail party, holiday party, or any corporate gathering for any entertainment purposes imaginable. Her three main decks play host to different aspects of your event, including the main dining and ballroom deck, the cozy and stylish party lounge and open-air great viewing skydeck. Additionally, the vessel has two bars and two dance floors, is equipped with state-of-the-art audio-visual facilities and has luxurious bathrooms on two decks. Departures from many dock sin and around Miami, Fort Lauderdale or Palm Beach. for the “techies” of her time. She is certified to host parties for 2 to 120 guests, on 4 to 8 hour charters, who enjoy the elegance and luxury of America’s Golden Age. You will be surrounded by rich varnished teak, gleaming brass, and hand crafted beveled lead crystal windows from Paris, all among the many gracious details you will experience during your party. This 100 foot luxury yacht, Coast Guard Certified for up to 65 passengers, making it the perfect choice for your personal or corporate event. This Dinner Party Yacht provides the perfect atmosphere for any event, from corporate parties to weddings. Let the your Concierge help you plan the perfect setting to meet your needs. Individualized service is what sets this Party Yacht apart. The 122′ yacht is luxury from stem to stern. Featuring a spacious flying bridge, a full galley, and an expansive, sumptuous salon with adjoining bar. The Master stateroom is forward of the main salon, with a king size berth, entertainment system, and ensuite head with a shower and marble vanity. Below decks are three additional staterooms, with a king size berth in the VIP stateroom and two single beds in the guest suites. 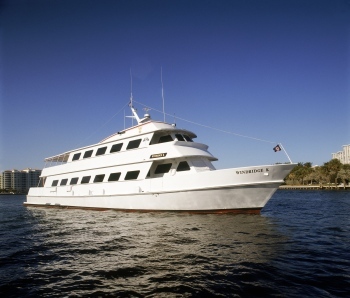 The vessel comfortably sleeps up to 8 people, and has the range to cruise the Florida Keys and Bahamas in style. This Exclusive Motor Yacht is 100 feet of unparalleled luxury. Weighing 151 tons, it features a custom interior by designer Marty Lowe. Sumptuous interior fabrics surrounds throughout and, with a beam of over 21 feet, you’ll have plenty of room to stretch out or entertain guests. The 100′ Motor Yacht is for those demanding the absolute top of the line in luxury. This 80 foot luxury yacht, Certified for up to 45 passengers, making it the perfect choice for your personal or corporate event. This Dinner Party Yacht comes equipped with and amazing entertainment system, a large sun-pad, a spacious upper deck, and a gorgeous salon. Let the your Concierge help you plan the perfect setting to meet your needs. A Premium Bar and Full Catering is what sets this Party Yacht apart. This Yacht is an 111′ magnificent and spacious luxury yacht charter vessel which is an ideal location to host a large wedding party, corporate cocktail party, birthday party, private dinner cruise, bar mitzvah, quince and other dinner and dancing celebrations. This Yacht has 3 large decks to accommodate up to 400 passengers and features a 45-foot beam and 8-foot ceilings. This majestic ballroom is fully air conditioned and features unique, modern windows that allow for entirely unobstructed views. Plus, a spectacular sky deck and several open air decks scattered throughout the vessel allow for unique entertaining options. 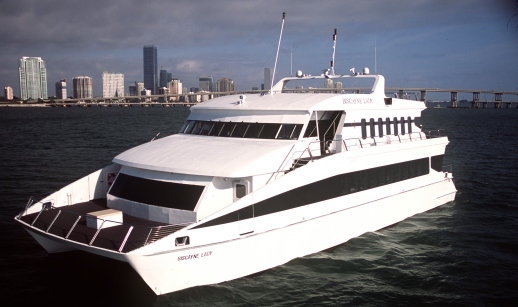 Her Austral manufactured catamaran design of twin hulls, offers the most stable and comfortable cruising experience on Biscayne Bay. This Yacht’s spacious and ample convention space allows for additional charter additions like DJ service, live-bands, cigar rollers, casino tables, comedians and magicians. This Yacht is a graceful 74′ elegant party yacht based in Miami, Florida. She is perfect for affordable social functions like private birthday parties, sightseeing cruises, dance cruises and cocktail cruises. 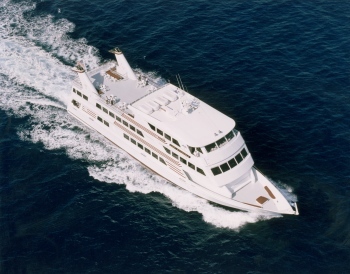 The boat has two main decks to enjoy the sunshine and sea breezes on the upper deck or relax in the air-conditioned comfort of the interior salon. 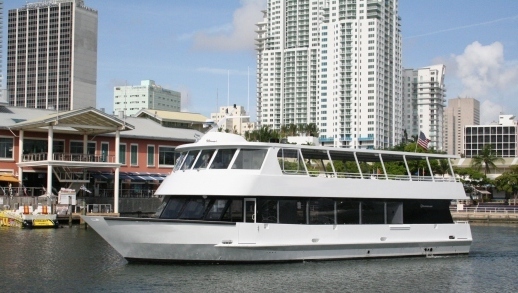 She mainly departs from downtown Miami but also departs from different docks around Miami and Fort Lauderdale. She is fitted for up to 140 guests. 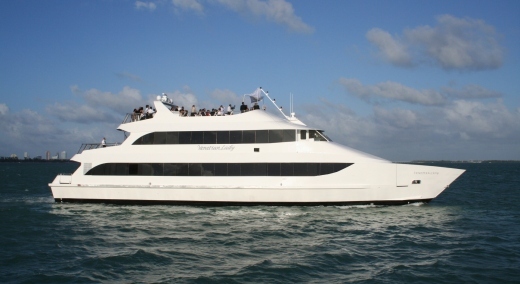 80 Foot Private Party Yacht, Palm Beach to South Beach Miami. Groups Welcome, Music, Entertainment and catering is all available. This 100ï¿½ yacht exudes unmistakable class and style, perfect for hosting private charters from corporate dinner cruises to unforgettable weddings as well as birthdays and other custom events. Upon entering the main deck, guests are greeted by professional and friendly staff as they enter the spacious and well appointed dining room, capable of seating up to 100 guests, where an exquisite dining experience awaits them. Whether taking in the spectacular views from the expansive windows throughout the dining room, or perhaps from the bow of the vessel, which is a favorite locale by many guests while enjoying cocktails, every area on-board was designed to provide unparalleled opportunities to experience the beauty of South Florida as your charter cruises by some of the most sought-after sights! luxurious yachts. We pride ourselves in being the best. 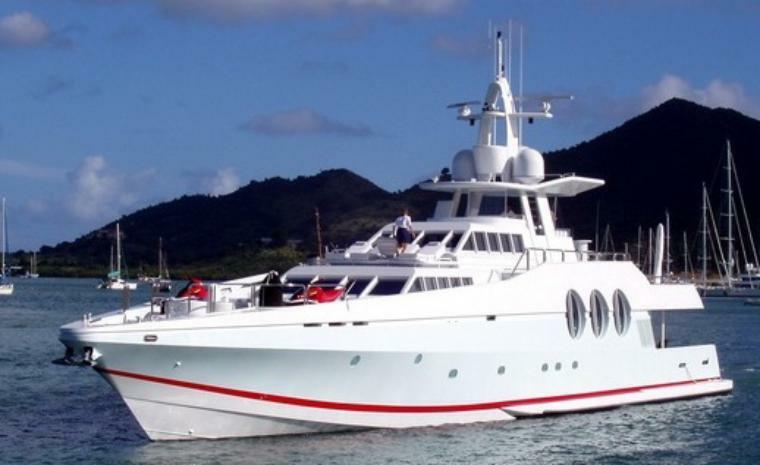 At 142 feet in length this Miami Party Yacht can be most accommodating even at capacity. 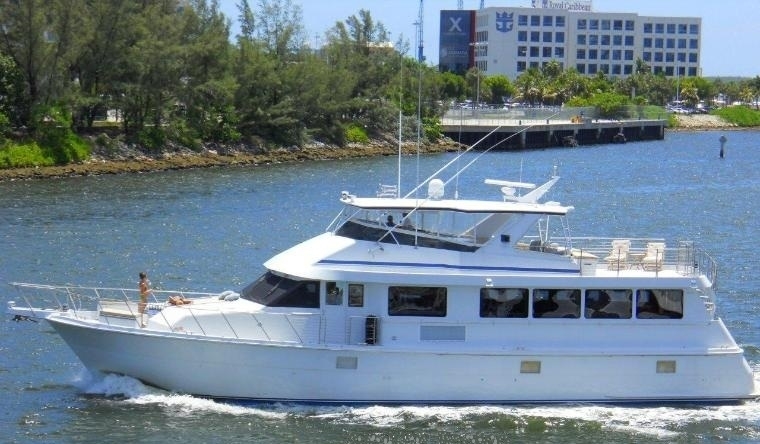 This Party Yacht resides all year long near our office in South Florida located in Ft. Lauderdale and can be chartered or boat rented for events covering the area from Fort Pierce to Ocean Reef in the upper Florida Keys. 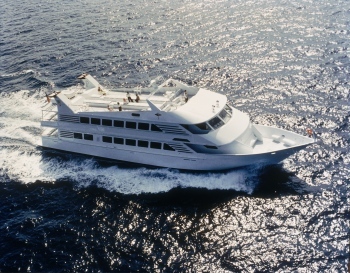 You can charter this Mega Party Yacht for your next special event or party for minimum of 80 guests and maximum of 500. Make your next event memorable with a luxury four hour charter through the intercoastal waterways of South Florida from Palm Beach to Miami and the keys. Click to see our full selection of Party Yachts in Miami.